Porter Eulah 1/22/1907 1yr 7mo ?dy d/o C.M. & D.C.
Porter George W. 3-04-1892 78-04-? Hannah 9-01-1868 51-08-23 s/o George W.
Emily W. 7-12-1842 25y 6m 3d w/o Marcus A.
Porter Milton No dates Co. E. 11 Pa. Cav. Bertie No Dates Our Dau. Schaffemaker (?) Mary F. 12-3-1893 38 yrs. w/o J. E.
Stella S. 9-06-18?? d/o J. E.
Shedden Jennie Can't read dates d/o ? 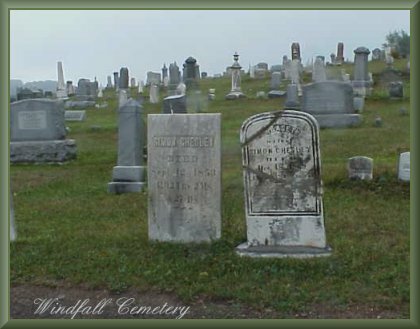 Linnie 5-22-1865 4/26/1902 w/o F.E. Finally found a few minutes to continue my tour. Wanted to fill in death year for my other grandmother-Evelyn Shedden lot 6-62 1920-2003. Again I enjoy your site so much.